This is another family Christmas tradition. We’d snack on shortbread first thing in the morning while the bigger, more elaborate Christmas breakfast was still being prepared. Not that this should in any way count as breakfast. But it’s tasty, and if you have a gorgeous shortbread mold, it’s also beautiful as a gift. Cream the butter and sugar together until it’s blended well. Add vanilla. Gradually add flour (and salt if necessary) and keep mixing. Don’t freak out if it seems way too dry—it will eventually turn into a pretty firm but moist dough. 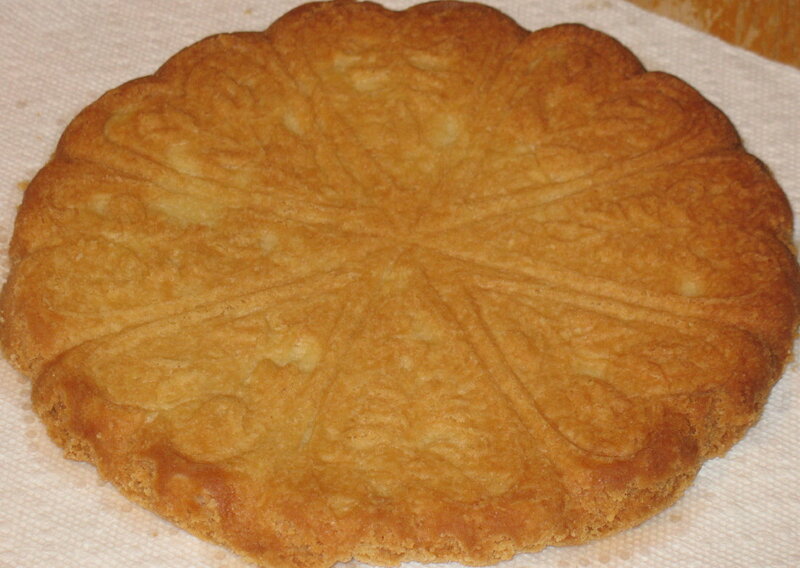 Spray the shortbread mold with cooking spray. I usually smear it around with a paper towel to get into the nooks and crannies. Put the dough in the shortbread mold and press it in well (for aforementioned nooks and crannies!). Prick the surface with a fork all over (if it starts puffing up while it bakes you can always pierce it a little more). Bake at 325° for 30 to 35 minutes, until it’s golden all over and a bit brown on edges. Let it cool for 10-30 minutes or so, then use a butter knife around the edges to loosen it and flip it onto a surface. If you cut it while warm it won’t crumble as when it has cooled. A couple of years ago I had a terrible time finding a lovely shortbread mold like my mom had, until I finally stumbled on Brown Bag Cookie Molds. They have a bunch of products and recipes, but take a look at these super-pretty shortbread pans. In fact, I meant to make and post about shortbread earlier, because I think that the pans make a great gift for a baker (or aspiring baker). You can see, close to the bottom with that second link, the oh-so-nice box for the pan. But, um, sorry. My baking is behind schedule this year, so I’m just getting around to it now. I love the Holiday Deliciousness!